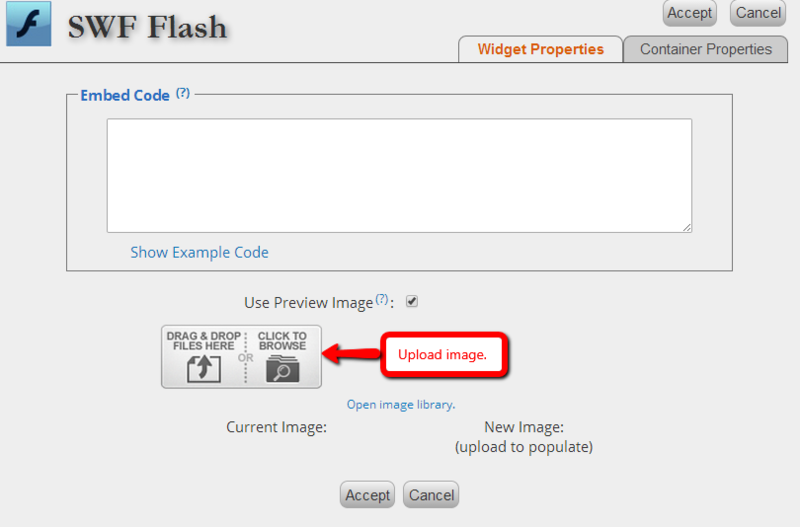 The SWF Flash Widget, available to all paid plans, allows you to easily embed flash .swf files into your TabSite. 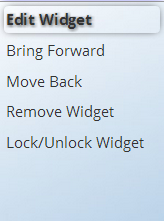 Drag the SWF Flash widget onto your tab page. Paste the embed code in the field provided. Please note the SWF file must be hosted on a web server somewhere. If you would like to use a custom preview image, check the Use Preview Image box. Choose an image from your Image Tray or upload a new image by dragging it to the Drag to Upload box. Once you are finished, click Accept. EDITING A PREVIOUSLY CREATED SWF WIDGET: To edit the content that you have previously added to your TabSite, right click on your Content, and click on edit. This will bring up your editor again. You can also go to the "Layers" tab in the TabSite Manager below "Widgets" and click the Edit link next to the SWF Widget you want to edit. This window will appear. Just choose Save & Continue to save what you are doing and keep working, or Save and Close. Then click Okay for the succeeding windows.